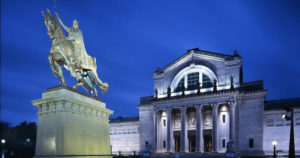 Join us for an afternoon docent-led tour of the Kehinde Wiley Exhibit: St. Louis. Artist Kehinde Wiley spent three years in St. Louis working on capturing the essence of our community, both the blessings and the troubles. Wiley is the first African-American artist to paint an official U.S. presidential portrait for the Smithsonian National Portrait Gallery. We will also be guided through the Graphic Revolution Exhibit: American Prints 1960 to Now, which includes prints by Rauschenberg, Warhol and Lichtenstein. These two fantastic exhibits exemplify artists who have changed the boundaries of art in the 21st Century. You don’t need to be an art connoisseur to enjoy this experience! Immediately following the tour, join us for refreshments, a time to schmooze with friends and a discussion led by our own member, Bruce Feldacker, art expert and retired labor attorney. Cost: $25.00 ($15 if you are an Art Museum Member & bring your SLAM membership card with you). Payment is required at the time of registration. Payment Options: Online by credit card with the form below, or you may bring a check or cash to the Shaare Emeth office and write on the envelope: attention Baby Boomer Event.